Stock Market Trend Forecast for 2011. This analysis forms part of a series that is working towards a trend conclusion for the stocks stealth bull market for the remainder of 2011. Ensure you are subscribed to my always free newsletter to get this in your email in box on completion (including ebook). Interesting article as ever but I have a few misgivings. You state that a rising oil price is 'bullish' for stocks but surely it is the other way round? A rising stock market means higher demand leading to higher oil price. Surely low oil prices are much better for the economy in general and therefore stocks. It seems to me that the 2008 crash was caused by the $148 oil spike, and the big market recovery of 2009 by the fall to $40/barrel. In the last year or so the FTSE has basically treaded water as the oil price has risen. Seems to me now that with oil over $100 there is very little upside in the stock market. The actual trend as per the second graph suggests the opposite. i.e. generally stock markets like oil prices trending higher (not spiking) as it is a sign of economic strength. Thanks for your reply. I think we might have to agree to disagree on this one! I've just had a look at a historic Dow graph and I notice there was a very strong 5 year bull run from around 1995 to around 2000. This coincided with historically low and stable oil prices during that period (about $23/barrel, inflation adjusted). I personally think that if a hypothetical mega-oil reservoir was discovered and the oil price dropped to $40/barrel the stock market would go through the roof. I think to answer this question we all need to look at the bigger picture here. Stock markets move due to buyers and sellers in the market. 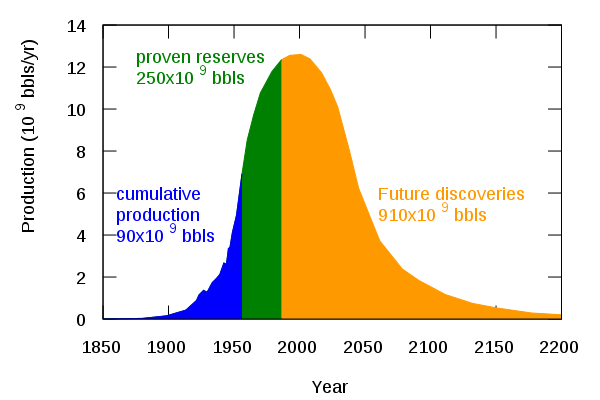 If the hypothetic mega-oil reservoi was discovered then yes the oil price would drop. Now surely the impact of this on the stock market depend on each single stock fundamentals. Say the S&P500 was made up of 50% oil companies then this would have a large impact on the index. In essence you cant really answer the question without looking at the bigger picture.